The gardens have been open for one day in July for the last ten years and have been included in the Cuttings section of the Sunday Telegraph’s Garden Supplement for the last two years which has resulted in holiday makers to South Wales coming along to see the gardens. 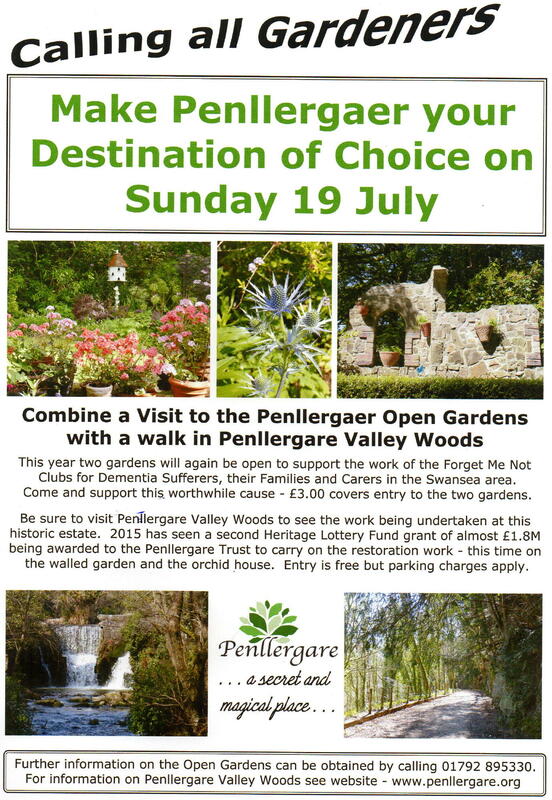 This year we are suggesting that gardening clubs from further afield in South Wales may like to include a visit to Penllergare Valley Woods while in the neighbourhood. Penllergare Valley Woods is not well known in South Wales but it is an estate that is being restored to its Victorian hey day. A £2.3 million Heritage Lottery Grant saw the start of the restoration work and last month a further £1.8 million was awarded to cover the restoration of the walled garden and orchid house.